The Tahquamenon river was made famous in the Longfellow poem Hiawatha. According to Indian lore, the origin of the name Tahquamenon is attributed to the water's amber color, which is the result of leaching of tanic acid from the cedar and hemlock swamps that feed the river. The Tahquamenon is special in many ways. One little known fact is that it is the second largest waterfall east of the Mississippi, with Niagara being the largest. One favorite leisure time activity for Jack and Mimi Barrett, grandparents of the current owners, was to make frequent trips canoeing, portaging and camping as they traversed their way from their home in Newberry along the river to the falls. Their love for the area compelled them to purchase the land adjacent to the falls. All the while, Jack dreamed of a time when the Tahquamenon Falls and forest could be made available for all to experience. 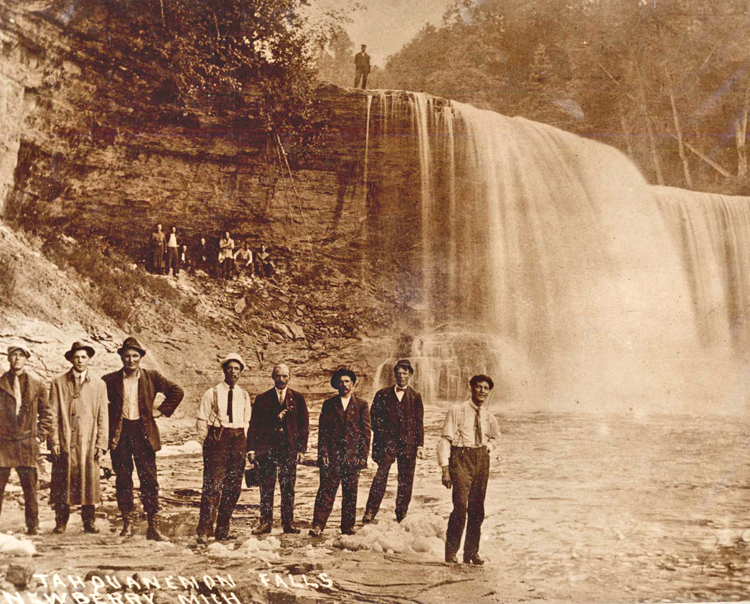 This dream would lead to fruition and a large contribution to the Upper Tahquamenon Falls History. Up to this point in time, mid 20th century, the falls were inaccessible except by boat. When the time was right, he orchestrated the construction of a road to the site and then negotiated with the Department of Natural Resources for the gift of his land to be used specifically for a State Park. A restriction in the deed directed that the road and parking lot would terminate 3/4 of a mile from the falls and that visitors would proceed on foot, thus preserving the parks natural beauty and virgin forest. So what exactly is Camp 33? Logging camps were often given numbers rather than names and this camp rightfully received the name Camp 33 as it was the 33rd logging camp the Barrett Logging Company was to construct. In 1950, a replica of a logging camp was constructed under the watchful eye of Jack Barrett; it was to serve the public as an eating and resting place. In 1990, the grandchildren of Jack and Mimi Barrett rebuilt Camp 33 and dedicated the new structure to the man whose forsight and philanthropy made possible the experience we all enjoy today. In 1996, the Brewery & Pub were built in keeping with the founder's vision. The focal point of all structures is the fire... a logging camp must! The warmth of the fire can now be enjoyed in all seasons. Cheers!